Robin Barrett lives in Ottawa, Ontario, where she supports her husband, Keith, diagnosed with Alzheimer’s disease in 2016. My husband Keith was diagnosed with young onset dementia (YOD)—probable Alzheimer’s in December 2016 at 57 years old. This was following about two and a half years of seeing various specialists. At one point, he had seen about six different neurologists. Keith and I have been together since 2004 and married in June 2016. We eloped together in New Orleans and it was a magical time. We have a blended family with six boys (all now adults) and five grandchildren. I can tell you how much I cherish my partnership with Keith. He is kind, generous, creative and hard-working. Over the past 15 years, we have been there for each other and plan to continue to do that. Keith and I are in this together. us has needed support at times. When I introduce myself or he introduces me, it is as his wife. I noticed changes in Keith’s memory and behaviour about three years before he was diagnosed. I would try to talk to him about it. The changes were very subtle at first. He would express frustration about someone suggesting he had talked to them about something. I was hoping it was from something else and not dementia. As his wife, I was heartbroken to watch him go through the process of being tested and receiving the diagnosis. I think I felt numb at first and then a bit relieved to know what it was after over two years of seeing doctors. Because I had seen the changes in him slowly over the years, even though I think I knew what they were going to tell us, I kept hoping it was something else. The person who gave us the news was very kind and compassionate—she was the neurophysiologist who completed the testing. She warned us that reading the clinical report would be difficult. Keith was advised to go to the Memory Clinic, get his affairs in order, consider not doing the numbers or financial part of his work and plan to retire. Keith and I talked a lot about what the doctors said and how he should not make some of the suggested changes. That he should keep working and maintain a routine. being said, Keith finds larger gatherings difficult now, so we have likely not been as present at family events in the last few years. SOME people understand and for others, it helps to add distance, too. We have had both a lot of support and then distance from some. Your circle becomes smaller, but for many reasons. Most people say they don’t understand how this will play out for a person who is younger, or often mention they had a grandparent with Alzheimer’s. Some have questioned why he still drives or how long he’ll be able to work. Mostly I notice people feel sorry for him and I, like there is no way that we can still be enjoying things in life. Sure, some things are different and we are scared or cautious of what the future may hold, but we try to just enjoy things as we can. Keith and I recently got tattoos of Dory the fish from the movie Finding Nemo who lives with memory issues. We did this so that when people talk to us about our tattoo, we can educate them that people can live with dementia. Telling people about it helps bring awareness to reduce the stigma. This was the hardest part for me as his wife. Overall, I would say at times it felt like our concerns were dismissed because of his age or his capability. Keith and I are both very independent in many ways, even though we are very much partners in life. I think because Keith appears very capable to others (and he is) they often don’t notice the changes in him. It feels like medical professionals are very resistant to provide this diagnosis. I understand why, but we need to be better at this. I know it’s hard to tell someone this news and the process right now is to rule out all other things. I remember at one doctor’s appointment, Keith told the doctor that they had to find a better way to diagnose dementia. Make businesses dementia-friendly. Have people in coffee shops not rush people, or offer dementia-friendly lines. Be patient and pay attention to cues. Make sure to include people with dementia in conversations and ask them what they want. Don’t assume that if someone has dementia, then they can’t contribute. Ask them, not their care partners. Know that there are people under the age of 65 living with dementia and that they have different needs than people who are older. I recall this quote when thinking about stigma: “When you have met one person with dementia, you have met one person.” They are more than a diagnosis, a chart or a tag on a wheelchair or nursing room door. They are not people you can clump together the way you might for items in your home. They are human, still needing love and respect, still giving love and joy. Let’s include them in their care. I am not a “caregiver” just because my husband has Alzheimer’s or dementia. Know that when we signed on to be partners, we signed on to support each other. My role does not change just because of a diagnosis. We have cared for each other for years and plan to continue to do this. 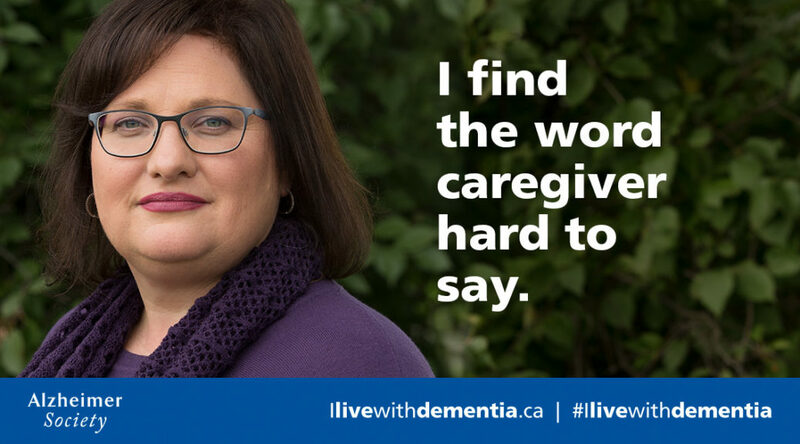 Visit ilivewithdementia.ca to read more stories by people like Robin and learn more about Alzheimer’s Awareness Month.